At iSave we are your one stop shop for everything you'll need. From the latest in consumer electronics, home appliances, personal care of pet products, we have what you want covered. We are here for you and trust that you will have a great shopping experience with us. We appreciate your business! For customer service inquiries or to initiate a return, please contact iSave at overstock@isave.com or 866-537-7076. You can initiate a return for new and unopened items within 30 days of delivery for a refund. To qualify for a refund, items must be in new and unused condition with all original materials and/or accessories. If a return is not received at our processing facility within 45 days, it may be subject to a partial refund. You will be responsible for return shipping costs. However, if the return is a result of a fulfillment error, product defect, or damage incurred during shipping, we will refund the full cost of the merchandise. We will provide a pre-paid return shipping label for Non-Buyer's Remorse returns. All returns are subject to inspection, and if found not to be an error on our part, the return shipping costs will be withheld from your refund. SPECIAL RETURNS INSTRUCTIONS: The Seller will issue a partial refund up to 20% for used or non-restockable items. 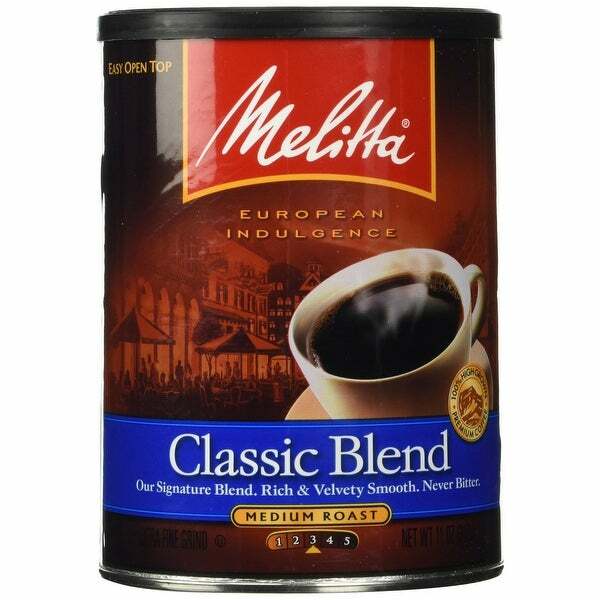 The Melitta Classic Blend Coffee is a pack of classic blend, medium roast ground coffee with a rich and velvety smooth taste. Appliances make life easier. Nowhere is this more evident than in the kitchen, where large and small appliances save people time and effort every single day. Although large appliances, such as refrigerators, ovens and dishwashers, are crucial to a functional kitchen, small appliances bring a diversity of conveniences to your kitchen. No kitchen should be without these top 10 small appliances. Learn everything you need to know about setting up a coffee station in your home. Shop our huge selection of kitchen furniture and small appliances at Overstock.com. How to Clean Glass Coffee Pots from Overstock.com. Our guides provide customers with information about how to clean glass coffee pots. Kitchen appliances make fun and practical Christmas gifts. Whether you're shopping for a busy chef, a foodie, or a new homeowner, an appliance that turns meal prep into a cinch is a thoughtful gift they’re sure to use. Check out this list of popular kitchen appliances to find the perfect gift for anyone on your Christmas list.